If you are a homeowner, you must have recycled or untouched wood in your basement. You might be wondering how to dispose them. Instead of stacking and eventually disposing these woods, you could make innovative accessories for your bathrooms, bedrooms, living room, basement, as well as other rooms. Here are 18 of the most innovative ideas for you. A child’s room is always filled with playing accessories. Therefore, extra storage always come in handy. 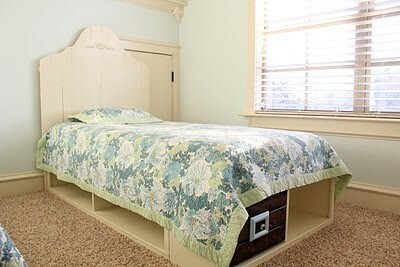 Building your kids’ bed with customized storage spaces is a small woodworking idea which requires as little as $50. You will need a circular saw, a nail gun, a drill, and a guide. You can spend at least $170 to buy a book shelf from Amazon. Alternatively, you can make one for yourself, and this will cost you less. However, this woodworking project might be expensive and dangerous if you don’t have the right tools. Who doesn’t like privacy? Everyone likes privacy. You could create and modify a murphy door which will act as an access route to your secret room. This project will cost at least $1500 for non-beginners in woodworking. If your room is too small for you, consider starting a simple project of constructing a murphy bed. Murphy beds are expensive, especially for people with small houses. However, you could spend just two days and a budget of $150 to save yourself from the trouble of a congested house. Installing new handles on cabinet handles is a small woodworking idea that should take less than a day. By the end of the day, you will customize your cabinet handles according to your desires. When looking for elegance, purchasing expensive handles should not be the only solution. When looking out for simple and cheap woodworking projects, you should not bypass the idea of a simple toilet paper holder. This is a beginner woodworking project that is both simple and cheap. Just for $10 and in under ten minutes, you can make an elegant holder for yourself. Some of the things that you need in a bathroom are mirrors and storage closet. You could use a budget of at least $100 to make a customize storage closet with a mirror frame. This woodworking idea is not only affordable, but it is recommended for your cleanliness and orderliness. If your kitchen cabinet cannot accommodate all your utensils, consider starting a simple woodworking project for the storage of utensils such as pans and ovens. The vertical bank for these utensils can be made using dividers and plywood shelves. Therefore, you should not spend more than a day making one. You could further tidy up your kitchen by making glass cabinets. All you need is a sealant, Plexiglas, trim moulding, and a $30-dollar jigsaw. This is not a beginner woodworking project, since it requires expertise. However, a step-by-step guide should be sufficient. Besides ensuring tidiness, woodworking projects in the kitchen are meant to facilitate functionality. You could facilitate your kitchen’s functionality by constructing pull-out shelves. All you need and require is a budget of between $50 and $100. Even though they look simple, these are not beginner woodworking projects. In order to create more space in the kitchen, consider making drawers which can fit into corners. This might seem like a small woodworking idea, but it is not meant for amateurs. It needs experts in home constructions as well as interior design. Homeowners who love wine should consider this woodworking project. It is a simple woodworking idea which is also space-efficient. You only need a fine wood finish and hex bolts that will firmly hold the wine bottles. Wood glue is also important for this project. A colorful room is created by pictures. For a budget of at least $50, you could create a gallery shelf where you can put photos. However, you should first have a meter box, saw, nail gun, and a stud finder. This beginner woodworking project can be completed without professional help. You might want to save extra space in your fridge. Therefore, creating a can organizer might be a simple, effective, and affordable woodworking idea. In addition to a budget of $100, you only need a drill and a basic saw. This project should take at least two days. The project should help in creating extra space for the basement. For at least $60, you could create a simple shelf where children’s toys can be stored. However, you should be conversant with simple constructional projects. In other words, you should be good with planning and executing. A basement bar is a complex woodworking idea. However, it can be completed effectively through innovativeness. A creative individual should spend between $100 and $200 for such a project. However, the budget depends on the size of the bar needed. If you have children, or pets, consider constructing a Dutch door. This woodworking project requires a budget of $50, which is significantly less than the $1000 that can be used to buy a pre-made Dutch door. You can creatively use the spaces under your staircase by creating a storage cabinet. With a budget of $400 you can create a single compartment for storing shoes and mats. If you are a beginner, it is advisable that you purchase pre-made products. What do you think about these ideas? Don’t worry if you have not picked something of interest. You can visit LuxuryHomeStuff.com for more beginner woodworking projects. Here you should find other amazing and fantastic ideas, some of which might be similar to the ones mentioned in this list. Therefore, you should not let wood and other used materials be wasted. Converted into use for your convenience.